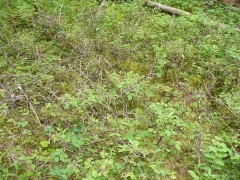 Huckleberry plants along the North Ridge Trail at Aleza Lake Research Forest. Is it drought? Is it the late spring frosts we had this year? Perhaps it’s the famous Aleza Lake mosquitos…? There are several disappointed bears and field workers out there who can’t grab and quick snack in the woods this summer – present company included! After several seasons of abundant huckleberry and blueberry crops at the Research Forest over the past few years, this growing season is turning out to be quite a change. Not only are the plants not producing berries, some of the patches are actually missing leaves, with the bare stems showing a carpet if grey like a stand of mountain pine beetle killed trees. What happened to the berries? If anyone can answer this question, please post a comment!